The Cuisinart CPK-17 is a cordless electric kettle that has 6 preset temperatures for different varieties of tea. The 1500 watts provide fast heat up, and keep warm option will maintain the set temperature for 30 minutes. This CPK-17 comes with a memory feature that allows kettle to be lifted off base for 2 minutes without shutting off or losing its place in the brewing process. 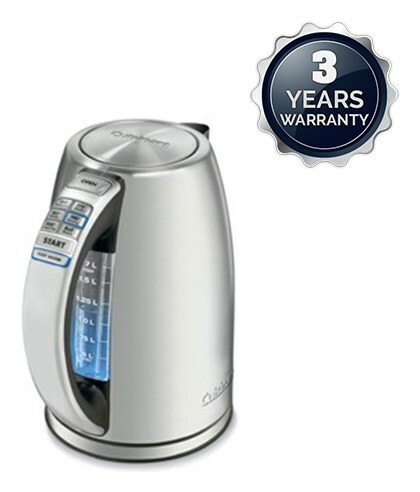 The Perfectemp Cordless Kettle Electric has many exciting features for users of all types. You can extend the lifetime of your Perfectemp Cordless Kettle Electric with the purchase of a FactoryOutletStore Factory Protection Plan. 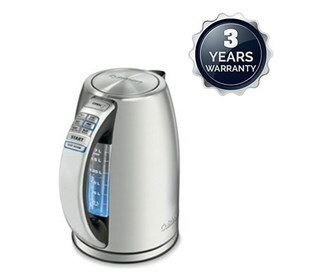 The Perfectemp Cordless Kettle Electric is sold as a Brand New Unopened Item.